Increase NP Gauge for an ally. Only available when Mash has the Ortenaus equipped. Apply Incoming Damage Cut for all allies. (3 turns). Unlock by clearing Replica (4/5) in Camelot. Unlock by clearing Reign of the Lightning Tsar in Anastasia. Apply Incoming Damage Cut for all allies. (3 times, 5 turns). This is Chaldea staff, Mash Kyrielight. After her Possessive Fusion with a Servant, she's called a Demi-Servant. Virtual Nobel Phantasm, Pseudo-Deployment / Humanity's Foundation. 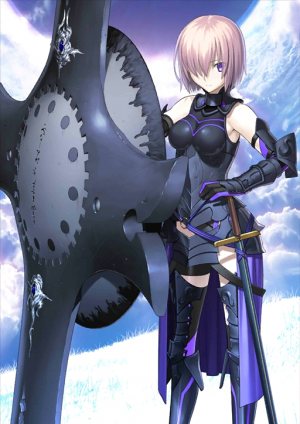 The Noble Phantasm accidentally deployed by Mash not knowing the True Name of the Heroic Spirit possessing her. Creates a powerful defensive barrier before her. It is believed the Noble Phantasm was crowned with the name "Chaldeas" because of Mash's innate wish of "seeing the future of humanity". A power manifested to protect allies and ally territory. 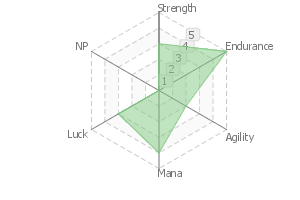 Applies damage reduction beyond defensive limits, but she is excluded from the effect's target. The higher the rank is, the larger the defensive area increases. Mash has acquired the True Name of the Heroic Spirit who possessed her. The name of that knight is Galahad, one of the Knights of the Round Table in Arthurian Legend. A saint who was the one person to acquire the Holy Grail, and return it to heaven. Chaldea used a special method to summon him as a Heroic Spirit. The core that made this possible was the catalyst used to summon him, "the place where heroes gather" - the shield that Mash holds that uses the Round Table. After passing through the seven singularities, and overcoming many battles, she has become a proper human being, and a full-fledged Servant. 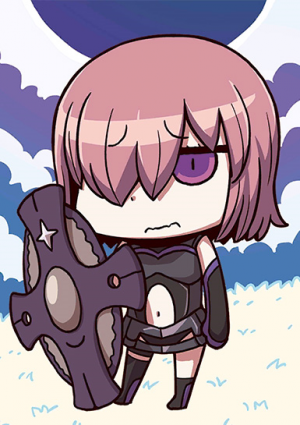 The virtual Noble Phantasm, Lord Chaldeas, which its True Name she is still unable to learn, is the wish that exists at the bottom of her heart. The wish to "see the future of humanity." ...The battle to stop the incineration of humanity will soon end. But what will be the conclusion of her journey? The beast of the stars silently watches over her. A special skill usable by Demi-Servants. and then make it into the user's own skill. In the case of Mash, the skill is "Magical Defense." Similar with "Mana Burst", the user transforms magical energy into defensive ability. it's possible to create a wall protecting an entire nation. 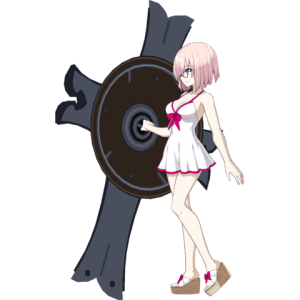 The form of Mashu Kyrielite, a Chaldea clerk, who underwent a possession union with a Servant. This is called a Demi-Servant. 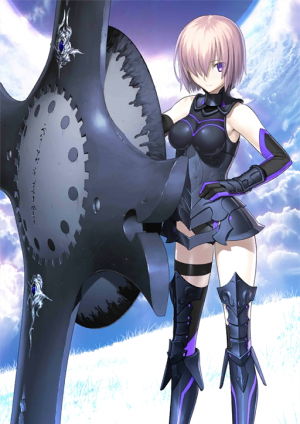 The Noble Phantasm deployed by Mashu in accordance to her instincts, without understanding the True Name of the Heroic Spirit possessing her. 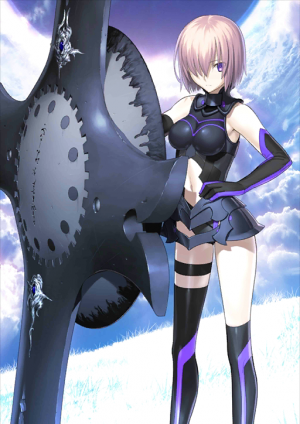 As for why it is crowned with the name of Chaldea, one would think that is because the wish that lies on Mashu's basis is 「to see the future of mankind」. Its strength is proportionate to the willpower of the user, and it has been said that, so long the heart doesn't break, those castle walls too shall never crumble. Succeed Phantasm. An unique Skill that Demi-Servants possess. One of the Skills that the possessing Heroic Spirit owns is inherited and sublimated in a self-taught manner. In Mash's case, it is 「Mana Defense」. A Skill of the same type as 「Mana Burst」, magical power is translated directly into defensive power. For a Heroic Spirit possessing a huge magical power, it would probably become a sacred wall that protects a whole country. The Noble Phantasm that Heroic Spirit Galahad possesses. The ultimate protection that employed the Round Table - where the Knights of the Round Table sat at the center of the Castle of White Walls, Camelot - in the form of a shield. Its strength is proportionate to the will power of the user, and it has been said that, so long the heart doesn't break, those castle walls too shall never crumble. 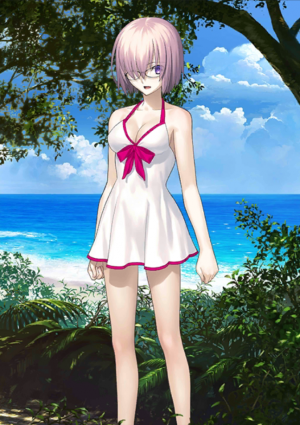 Mash cannot be burned or used to enhance other servants. There is no Shielder experience card, so only All-class experience cards provide bonus experience. 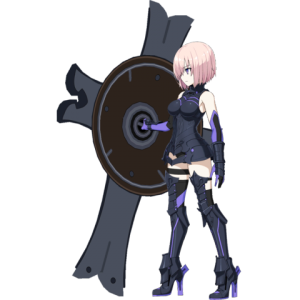 Mash's 3rd Active Skill was originally Battle Continuation C, but it was changed to the skill Shield of Rousing Resolution with the release of London. 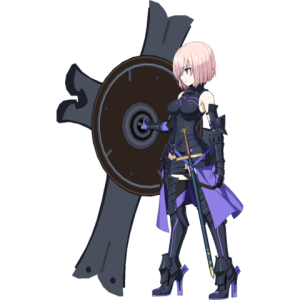 The Chaldea Standard Craft Essence originally romanized Mash's name as "Matthew." In Japanese, where pronunciation of "th" is not natural, マシュー (Mashuu) is how Matthew is written. The image was later corrected to "Mash." 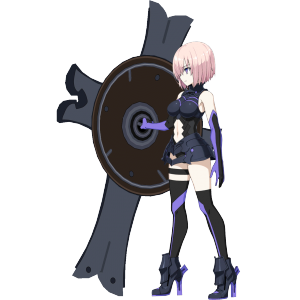 In the Fate/Grand Order ~First Order~ Cast List, the Romanization of Mash's name is "Mash Kirielight." Mash was initially voiced by Taneda Risa. These voice lines were retired on 30 Oct 2016 23:59 JST and replaced by Takahashi Rie's voice lines on 1 Oct 2016 00:00 JST. When upgraded to a 4★ Servant, her min/max stat values increase to 1455/8730 ATK and 2060/12877 HP. Unlock by clearing Lostbelt Chapter 1 Anastasia: Chapter 21. This page was last modified on 25 February 2019, at 02:06.